Memorizing angles can be a daunting process. Necessity is definitely the mother of invention. Or in my case, it's the mother of worksheet and chart design. During Joely's math lesson today, the need for a good way to memorize angles became painfully obvious. So I took a few minutes this morning to make up a chart and a set of flashcards about angles that Joely has already used with success. And as usual, I'm posting the 12-page set as a free download for your personal use as well. 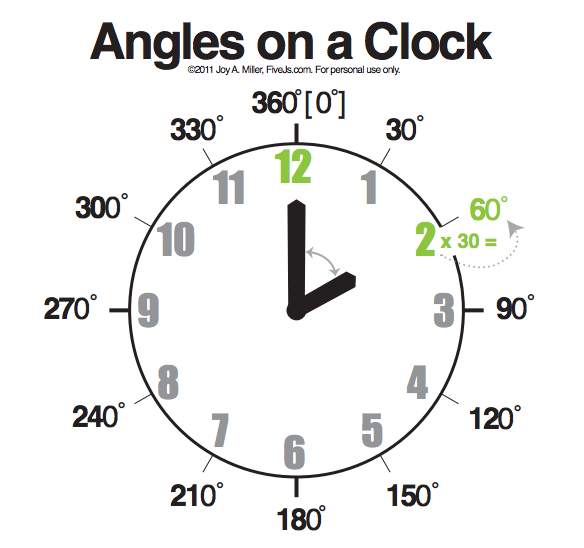 The Angles Set includes two charts, one that shows the measurements of a circle in 45 degree increments, and one based on the hands of a clock. The charts also offer tips to help memorize the various angles as well. 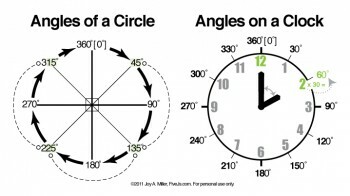 The other 10 pages are comprised of three sets of flashcards, one set showing angles as parts of a pie (filled in), another showing angles as lines, and the last showing the angles related to the hands of a clock. Answers are included on the back of each card, which can also be used for study. This is so great! Thanks so much! 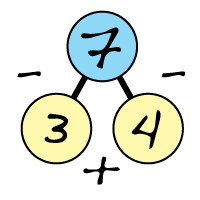 I had just been teaching angles to my son and I actually drew a little sketch of a clock to help explain it. Of course, your charts are so much better! I love your website and have to thank you for being so helpful and generous in sharing! Love your stuff, thank you for your hard work that makes me life easier.